You need a business plan, but… DON’T BUY A BUSINESS PLAN ONLINE… you’re just wasting your money. You need funding for your new idea or expanding your business. The first thing you learn on the Internet is that you need a business plan. Investors and banks will ask for a detailed business plan before even considering giving you money. However… needing a business plan usually means that you’re in a transition phase. It’s a super exciting time. It’s also a very busy time. Your brain is in overdrive trying to keep up with the things you need to do… you devote what little time you have to researching ‘how to write a business plan’, ‘business plan sample’, and perhaps ‘business plan template’… and then… you find out that writing a business plan takes a lot of time. There are so many questions that need to be answered in order to create a polished business plan. You need to do in-depth research on your industry, competitors, target market and financials. What are your competitors doing well, and where is there room to capitalize on the market? Is their price point better or worse than yours? How will you gain market share? Who is your target customer? What is the market size for your target customer? How many products do you need to sell in Year 1 just to break even? What does your realistic 3 to 5-year forecast look like? The business plan writing process helps you uncover a lot of things that you may not have thought about yet. Download my FREE Business Plan Questions for a full list of questions you need to answer when writing your business plan. Reason 1: Writing a Business Plan Helps You Learn About Your Business and Competition. The process will help you uncover a lot of things that you may not have thought about yet. I touched on this just above… writing your business plan is a process. You need to answer a lot of serious questions about your company. Researching and finding those answers brings many new things to light. An experienced business plan consultant will walk you through the process. A business plan consultant’s job is to do all the time-consuming ‘heavy lifting’, yet also make sure that you understand your business model as well as your completed business plan. This enables you to focus all your energy on your business during the business plan writing process, yet understand every detail of the business plan once it’s finished. Reason 2: You Only Get One Shot with Investors. I seem to say this a lot to prospective clients… but I really need you to get it, or you’ll waste a lot of time and money. You can’t simply buy a business plan. A client of mine decided to buy a ‘business plan’ online before coming to me. Here is a section that I cut and pasted from the ‘business plan’ they bought online. I keep putting ‘business plan’ in quotes here just to be sarcastic… this was not a business plan at all. A client of mine decided to buy a business plan online before coming to me. This is the business plan they received. With such economic outlook and strong business model, coupled with lifestyle change, the business over collaborative and communication platform are going to be the future in global social arena. In this scenario, a young group of young entrepreneurs have decided to ride over this opportunity. This business plan is prepared to conceptualise the whole idea into a structured document for initiating well-defined business. The business plan is developed to showcase a business opportunity. At the moment, [INSERT BUSINESS NAME] is highly poised to move forward to create big business opportunity with complete visibility in the near to medium term horizon. With the understanding of macro and micro economic environment, the business is to set the mission for its plan which is nothing but a concise version of group’s vision and its philosophy of doing business to create stakeholders value. Once mission is defined, the business plan would set the financial objectives with a clear timeline. The idea is to ensure that business returns are adequate and meets all stakeholders’ expectations in the course of business evolution over time. Again, this was cut and pasted directly from the ‘business plan’ that my client purchased online before coming to me. The only thing I changed was the [INSERT BUSINESS NAME] in order to really highlight my point. 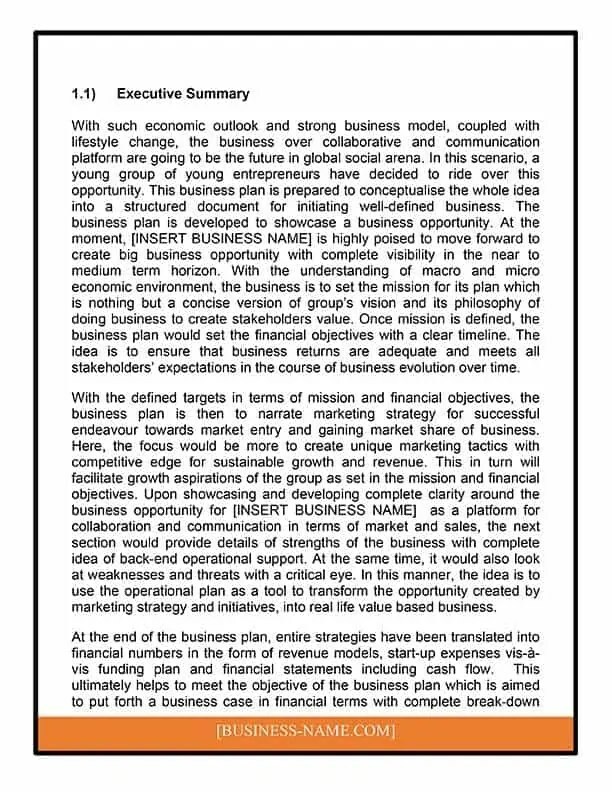 in 176 words, this ‘Executive Summary’ describes absolutely nothing. This is boilerplate text (fluff) that allows the ‘business plan’ seller to simply insert a new business name and send it out the door. There is no mention of the type of business, or even the industry for that matter! They simply changed the business name. AND, they charged for it. AND, the entire ‘business plan’ (16 pages) was equally as vague and fluffy. Would You Invest Your Money After Reading This? Does this get you excited to pull out your checkbook and invest? I don’t want you to learn the hard way like my client did. Simply don’t buy a business plan online. If you present an investor or bank with a vague, wordy business plan template that you purchased online, they will simply show you to the door. Well expressed without a doubt!